Modern bathroom vanities combine sophisticated elegance and minimalist functionality. There are many unique types of contemporary or modern bathroom vanities, such as floating vanities and vessel sinks. The signature features of modern bathroom vanities include smooth cabinetry and faucet design with little to no ornamentation. You can select a single vanity or a double vanity that is designed with a modern aesthetic. Modern bathroom vanities are perfect for your home if you are looking at updating your existing bathroom. Pair a modern vanity with a tiled backsplash and floating mirrors to give your bathroom a finishing touch. A contemporary bathroom is created with furniture pieces that embody current design trends. People tend to collapse modern and contemporary design into the same category; however, the latter is a reflection of existing design fads and the former is a reflection of mid-century minimalist design. There is crossover between modern and contemporary design, but it is important to make the distinction between the two when you are shopping for a contemporary, rather than a modern, bathroom vanity. Contemporary bathroom vanities are generally more eclectic than modern bathroom vanities because they borrow from many unique trends that are occurring in the present moment, rather than a fixed set of design elements. If you are looking for a common thread that ties together contemporary bathroom vanities, then it is helpful to follow existing designers who combine old designs with their imagination. All bathrooms have the potential to become a personal oasis; however, sometimes it can be hard to find the perfect accessories for small bathrooms. Choosing a modern vanity for a small bathroom is a perfect choice because of its stylish and simplistic design. These small bathroom vanities combine functionality and style into even the smallest space. If you are decorating a larger space, then a modern double vanity may be the perfect solution for your home. Double bathroom vanities are the perfect way to incorporate storage into your bathroom without losing space to free-standing cabinetry. Modern double bathroom vanities create and elegant and sophisticated look throughout your bathroom. Often times, modern vanities come in a variety of different materials from marble countertops to natural wood cabinets. Combine natural stone and wood in your bathroom to create a beautiful and modern bathroom vanity. Complete the look of a modern vanity by selecting one with metal hardware, like shining nickel. If you want to make your bathroom vanity the focal point of your bathroom, then dark cabinetry can make a bold statement. Black vanities are popular for bathrooms with modern design. You can pair a black vanity with white vessel sinks and granite countertops to make your bathroom vanity stand out from the crowd. Clean lines are also popular in contemporary design. Contemporary bathroom vanities often use materials such as glass and metal with unornamented fixtures. 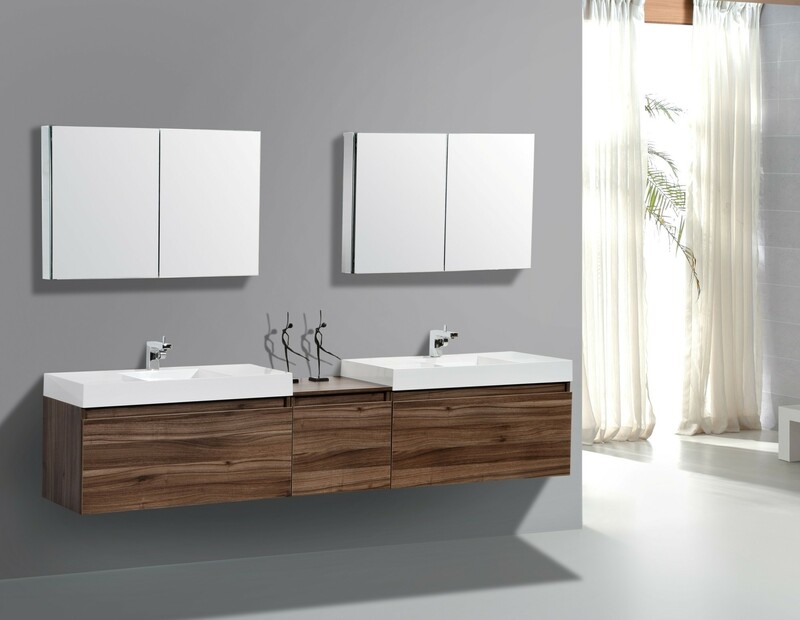 We carry contemporary bathroom vanities that are made from quality materials, such as premium grade woods and hand-glazed finishes. Contemporary designers are also focused on sustainability. Contemporary bathroom vanity sinks are made with sustainable materials, like granite, limestone, sandstone and slate. Similarly, contemporary bathroom vanity cabinets are also made with sustainable wood like white ash, black cherry, mahogany, maple, oak and bamboo. A contemporary bathroom vanity cabinet is a great way to give your bathroom an instant update. No other piece of bath furniture is capable of making a bigger fashion statement. And with today’s contemporary bathroom vanity cabinets, it’s never been easier to give one of the most used rooms in your house a makeover. Whether you are shopping for the master bath, children’s bath or powder room, you will find a vanity set that not only meets your needs, but exceeds your wildest expectations. Find a diverse selection of contemporary bathroom vanities online from DecorPlanet.com. Free standing contemporary vessel sink vanities shouldn’t be hard to find online. We take the stress out of finding contemporary vanities on the web by providing our customers with a unique and fun purchasing experience. Unlike its bathroom counterparts, a vanity can easily add a touch of whimsy and fun to your bath. At DecorPlanet.com, we look for pieces that put a unique spin on the ordinary – mixing styles, colors and materials that artfully come together to create a truly spectacular scene. We strive for the “wow” factor and favor pieces that will impress even the most discriminating designers. Modern bathroom vanities are popular additions to contemporary homes, offering the sleekest and most eye-catching designs in bathroom furniture as well as signature simplicity – a simplicity that makes these vanities essentially timeless. As sturdy and versatile as they are beautiful, our collection of modern vanities has the perfect cabinet for you.